Novita Nutrution hosted a momumental ribbon-cutting ceremony at their facility on Thursday, June 22, 2017. 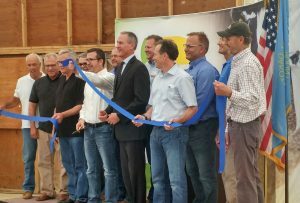 Governor Dennis Daugaard was on-site to conduct the ceremony for the brand new $95 million expansion project for the company. The investment is an initiative which helps them greatly expand their current operations in Aurora, SD. The plant has been under construction for two months. The company focuses on two products. NovaMeal™, the company's patened product, is designed to help farmers greatly reduce their food costs for dairy cows, increasing both the heath of the cows and the profit margins for the farmers. NovaOil is a high-quality vegetable oil for poultry. Bird Dog Equity has had a stake in Novita Nutrition since their early rounds of captial raise, along with other investors and Novita CEO Don Endres. "We're thrilled to be working with Don and his team on this project. He [Don] is one of South Dakota's great entrepreneurs," said Paul Schock, Bird Dog Equity managing partner, who was in attendance for the event. "We're really excited about the things Novita is doing, but we're even more excited that it's happening in South Dakota, right in our backyard. This is a company that we believe has a bright future ahead of them, and we're happy to be working alongside them." Read more in the Brookings Register here. Listen to the Brookings Radio release.